I am also testing USDCAD and EURAUD since 2019. Additionally, there are auto settings for EURCAD and EURGBP, but I am not using it on my signal account. Please read the blog post for instructions on how to set up the EA. Because the EA will trade around the New York close time (16:00 - 18:00 New York time), the GMT time will be different in summer compared to winter (DST: daylight saving time). But the EA has daylight saving times stored internally, so there is no need to adjust the trading hours manually. For backtest you should use GMT offset 0 (or set testerGMToffset to the correct value) and don't adjust for DST, the EA will do the adjustment itself. Be aware that past performance is no guarantee of future profitability (the EA could also make losses) and that optimized backtest results cannot provide a realistic prediction of future profitability. orderComment - Each trade will show this comment in history tab. magicNumber - individual magic number. The EA will only manage position of the chart symbol with this magic number. lotType - "fixed" or "increasing", where the lot size is calculated automatically. fixLots - fixed lot size in case lotType = fixed. lotStep - how much the lot size should be increased every equityPerStep (if lotType = increasing). equityHardStop - if the equity falls below that level the EA will close open positions (only of this strategy) and will not open any new positions. pipInPoints - for 5-digit brokers, this should be 10, for 4-digit brokers 1.
slippagePoints - Slippage used in OrderSend() function (points, not pips). 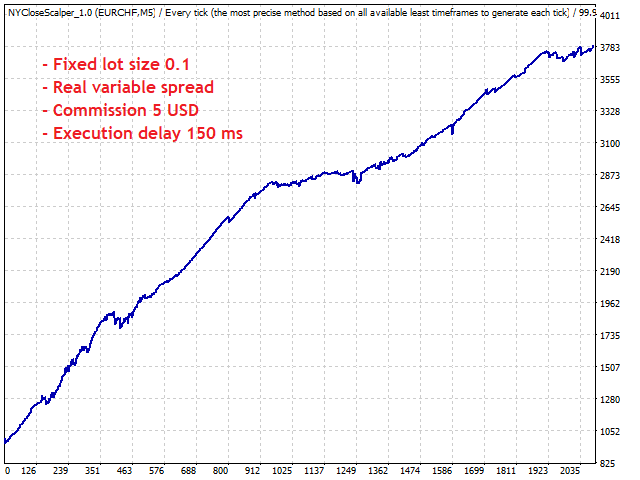 maxSpreadPips - maximum spread allowed for entry. If smaller 0, auto settings will be used, which are different for each currency pair. liveGMToffset - To set GMT offset manually. Usually this is not needed. skipSunday - if true the EA will not open positions on Sunday (GMT). startHourGMT - when to start trading (GMT). endHourGMT - when to stop trading (GMT). waitMinutesBetweenEntries - The EA will not check for new positions during the given duration. 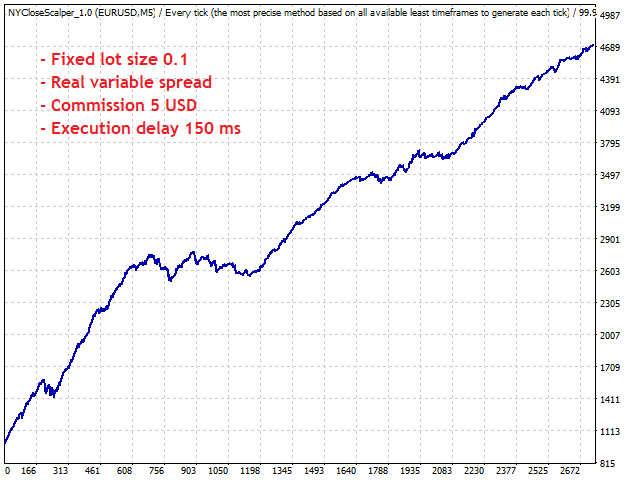 If you are sleeping during the trading hours you could limit the potential total risk with this parameter. If the last hour was a loss the EA will automatically increase waitMinutesBetweenEntries by 15 minutes. dontTradeTripleNegativeSwap - If true, the EA will not open trades on before swapHourGMT when the swap is negative on days with triple swap rate. tripleSwapDay - Day at which tripple swap is applied. On most borkers it is Wednesday. swapHourGMT - Swap hour used if dontTradeWednesdayNegativeSwap=true. testerGMToffset - Only needed for tester because GMT time is not defined in tester and your bar data might have a GMT offset. Please also have a look at the "What's new" tab for additional parameters. The best Night Scalper i have ever seen! The seller is very helpful, always ready to provide great support and guidance for the EA. I am very grateful for his assistance. you will not regret it when you buy the product! Still watching the performance on a live account, but Roman always offers very good support. 16 Feb : We should find a way to avoid trading in a low liquidity market somehow for keeping a good performance. Masterpiece. Breaking news filter is very helpful to prevent losses from unexpected events like brexit. Roman is the best skilled engineer, and he provides excellent support. nei commenti i miei risultati. in the comments my results. Excellent support!! EA very good!! Best product I have seen in more than a year. Good accuracy, good news filter. I am very happy with this one! I'm very satisfied with the EA. It's furthermore constantly improved by the Author. I use it in combination with the other EA from Authors portfolio for "trading at night". Good product , Good support. Finally I can make my review! I been using this EA for 1 month on real account, it is very profitable, and safe it is supported with SL, but most of lossing trades doesn't even hit the SL. My result is 117 win and 27 losses. and also the seller is very quick to response if you have questions! And Roman offers great support! 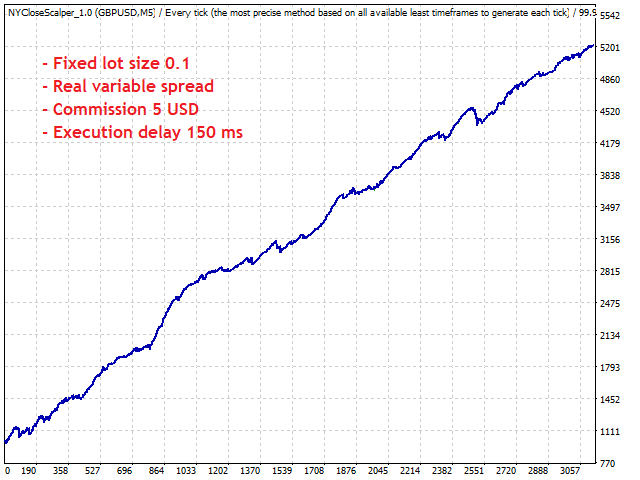 - The maxSpreadPips settings were changed. Now every used symbol will have its own max spread value derived from optimizations. - Added a parameter stopLoss for those who want to define an own value or do some optimizations. - Changed the DST tester settings. Now there is a parameter testerDataHasDST. Set it true if you want to backtest on data with DST, like GMT+2/+3 time zone. 1) Version 2.0 will not be able to read historic data files from earlier version. Therefore, if you don't want to miss a trading day please upgrade during the morning of a weekday (not weekend). - There are also default settings for two new pairs, USDCAD and EURAUD. 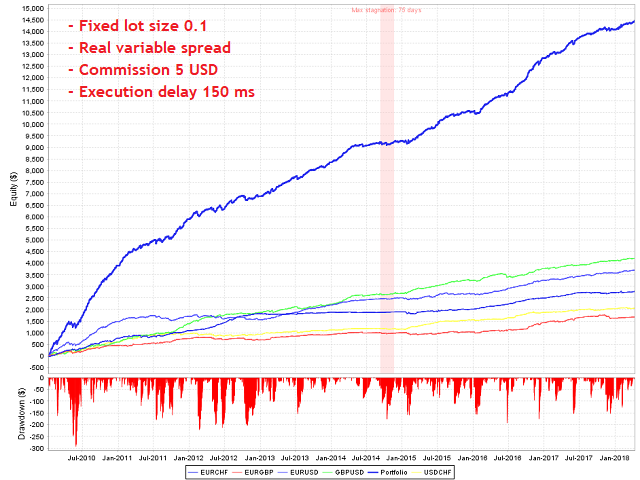 Backtests can be found in the blog post. They look good, but I only started to test them live in 2019. Therefore, I will only use them on small risk and also not on all signals. - The EA will now use news filter on all symbols, but with shorter pause times after events compared to NightWalker. 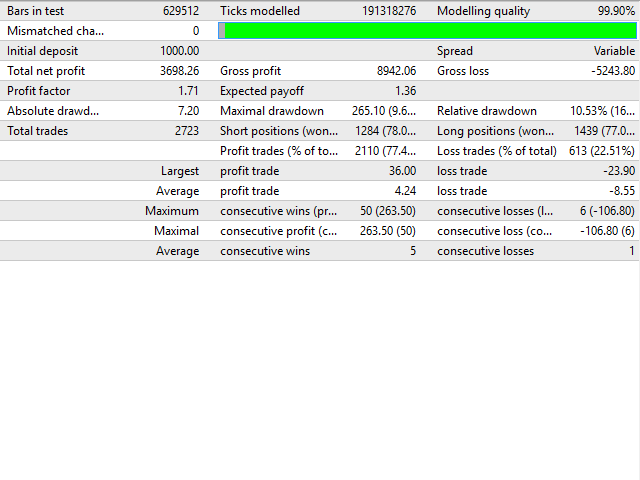 - Added exitLossesOnStockMarketCrashTrigger parameter. Set it to true if you want the EA to close filled positions when the crash filter triggers. Default is false. - Added parameters stopDayDecember and startDayJanuary so that users can decide whether or not to pause trading during the low liquidity period around New Year. Added a new parameter maxPositionsAllSymbols=2 to reduce the maximum risk. Since 2003 there have been only 9 occasions with 3 positions at the same time, so I think it is ok to only allow 2 to reduce the maximum risk and leverage. The stock market crash filter has been slightly improved. - Added historic SP500 data starting from 2003 to the EA file and optimized the stock market crash filter from 2003-2018. - Added a new parameter maxPercentageIncrease to prevent trading on days with an extreme increase in stock market during the last 8 hours (0 = auto settings for each pair). stockIndexSymbol - Here you have to insert the symbol for the S&P500 index, which is used for this filter. The default is set for ICMarkets where it is called "US500", but it might be different on your broker. To disable this filter, set the parameter to an empty string. maxPercentageDecline - In case you want to set your own value. If it is 0, auto settings will be used, which are different for each pair in the range of 1.3 to 2.2 percent. The EA has historic SP500 data stored internally, so it will also work on backtest (until the date of the last update). You don't have to change the stockIndexSymbol for backtests. dontTradeWednesdayNegativeSwap - true if you want to avoid trading in the direction of negative tripple swap. trippleSwapDay - Day at which tripple swap is applied. On most borkers it is Wednesday. swapHourGMT - Time of swap in winter (GMT+0), in summer it will be automatically adjusted with DST. The EA will now save historic data in a file (similar to NightWalker EA). It will be restored on restart of the EA so that EA can start trading immediately. This is needed to allow Sunday trading in case the VPS was restarted during the weekend. Be aware that the EA will always reload the historic data if it is not older than a few days. So if you intend to stop the EA for a day during the week (when the market is open), you might want to delete the historic data in the directory \MQL4\Files\NYCloseScalper_history before restarting it to prevent loading data that is too old. - Added a parameter liveGMToffset so that those who have problems with time zone settings of their VPS can chose GMT offset manually. - To calculate GMT offset it will use MetaTrader 4 GMT time which depends on local PC time. 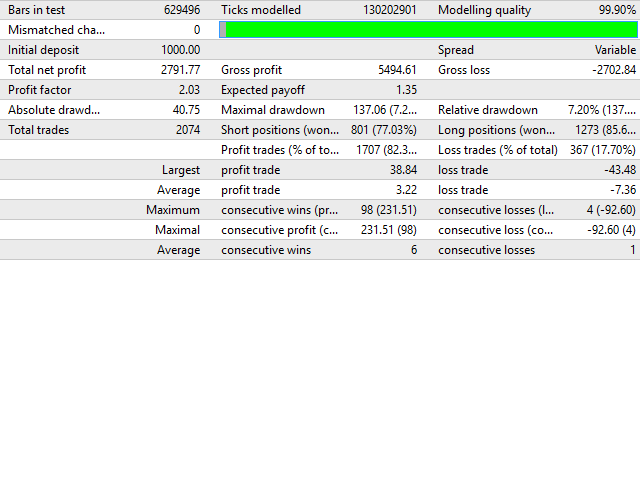 - Use MetaTrader 4 broker time for minutes and seconds (because local PC time could be off by a few seconds or more). - Check only once on connection to the broker's server whether the MetaTrader 4 GMT time is correct. If it is not correct, an alert message will be shown. Only a small, but very important update. Now the EA will no longer use the MT4 GMT time. The MT4 GMT time depends on local PC time, which usually is wrong by a few seconds and sometimes even hours. Therefore, now the EA will determine the GMT offset itself and use broker time to calculate GMT time. You have to allow web requests to http://currencystrength.de to use the automatic GMT offset calculation. Also added a parameter testerGMToffset to enable backtests with GMT offset. Daylight saving time will still be applied automatically, so don't backtest with DST!